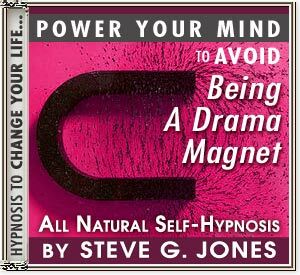 Power Your Mind Naturally with Hypnosis to Stop Being a Drama Magnet! YOUR SUBCONSCIOUS MIND HOLDS THE KEY TO STOP YOURSELF BEING A DRAMA MAGNET! Wherever you go, does drama seem to follow you? Do you unwittingly surround yourself with toxic friends, or emotional vampires? Do you so often attract people or care for those who always seem to offload dramatic information, causing both of you excess strain and worry? Do you have trouble staying objective and impartial when people come to you for help? Our Power Your Mind to Avoid Being a Drama Magnet Hypnosis CD or MP3 is for you. As a compassionate human being, you already have the desire to help others where you can, even just by being a good listener or a shoulder to cry on. In fact, you always seem to be the person that many people end up turning to, again and again, right? And you may even do this professionally - or want to. Theoretically, this should make for a lot of happy endings. So why is it that often the most lovely and compassionate people, like you, end up being dumping grounds for other people's emotional dramas? Why is it that you offer great advice, support and comfort - but the people you try to help just seem to keep carrying on without change? And instead of working on their problems, why do they seem to be satisfied enough with your neverending compassion? Take the case of Life Savers at the beach or the local pool. A Life Saver has the natural compassion to dash into dangerous waters to assist a fellow human being who is drowning. At the same time, it is the natural instinct of the drowning person to grab on to whatever they can to survive; sometimes trying to push the Life Saver down into the water, in order to boost themselves above. A good Life Saver, therefore, must know how to help the drowning person, but at the very same time, must ensure that they maintain control... otherwise both of them will drown. We all have a natural desire to help friends and family, but sometimes the people we care about end up drowning us when we try to help. They may turn to us for guidance, but walk away free while we are left with their worry. They may constantly drop bombs or ask for too much, even when they know you have troubles of your own; safe in the knowledge that you will never say 'no' to their cries for help. So when do you know your usual methods of helping need to change? When can you fairly say 'enough is enough'? And afterwards, how do you be at peace with that sort of decision? Our Power Your Mind to Avoid Being a Drama Magnet Hypnosis CD or MP3 will help you to rid yourself of these battles within, to be able to instinctively deal with the battles around you. how to be at peace with distancing yourself from loved ones when they are continually creating unneccessary dramas and stress for you.